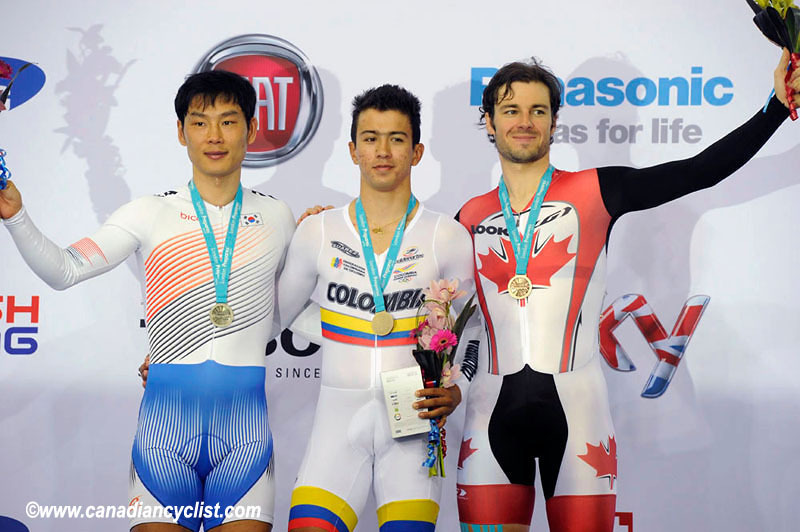 Zach Bell of North Vancouver, BC, successfully completed an impressive comeback on the second day of the men’s Omnium event, taking the bronze medal on Saturday at the fourth and final UCI Track World Cup, ending his season in the fourth place overall of the 2012 UCI World Cup circuit. Beginning the second day in fifth place, Bell knew he had to post a set of strong performances to move up the rankings and have the chance to get on the podium. He began his workday with a bang, finishing second in the individual pursuit to get right back in the hunt for a medal. In the Scratch race, he excelled and ran a very strategic race, always on the lookout for his main rivals. He finished in fourth place to climb to third in the overall standings, with only the kilometre-long TT remaining. In the time trial, Bell yet again delivered a strong performance, posting the fastest time. This last race of the gruelling six-race event kept Bell in on the third step of the podium. "It definitely started off well. I have been progressively improving the flying lap race, and that’s good because I haven’t done a lot of work on it. To bounce back today was really positive, especially in this venue, and with the calibre of the riders attending the World Cup." Bell, who grew up in the small Northern community of Watson Lake, in the Yukon. The two-time World Champion in the Women's Omnium event, Tara Whitten of Edmonton, has undertaken another big challenge, the day after she broke once more the Canadian record in Women's Team Pursuit with her teammates. 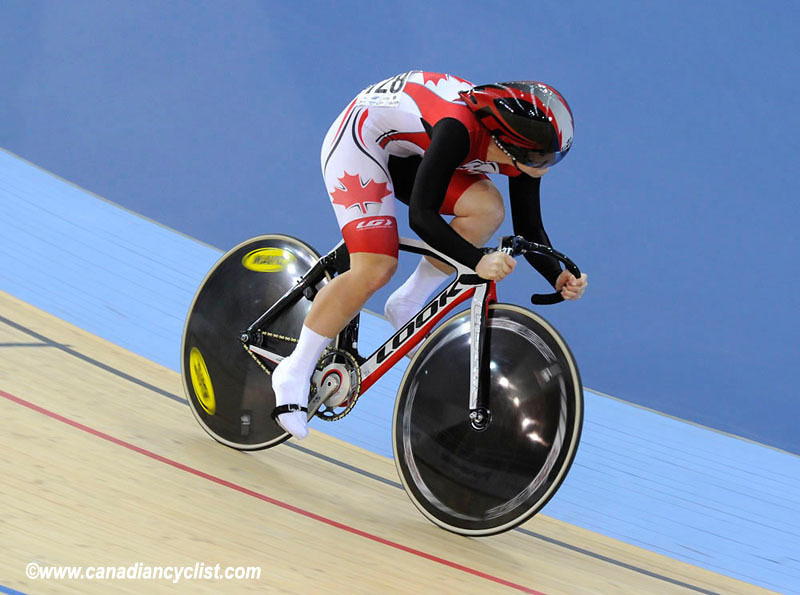 Whitten began the first day of competition of Women’s Omnium with the fifth fastest time in the 250m flying lap. In the second race, the Points Race, Whitten finished 10th, scoring six points in sprints. After a long rest in between the two sessions, the Canadian champion of the event took the second rank of the Elimination race. "I am happy with how my body felt today. It’s really exciting to be part of this team," said Whitten. "Knowing I’m feeling well will give me a lot of confidence. Wearing the rainbow jersey forces you to change your tactics. People pay more attention in your riding." The final three races of the women’s omnium will be held tomorrow during the fourth and final day of racing at the new Olympic velodrome. 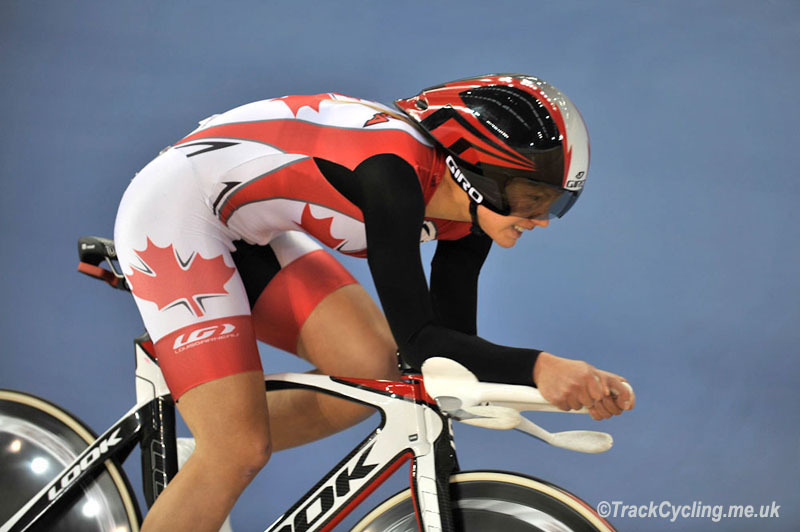 In the Women’s Sprint competition, Monique Sullivan of Calgary, Alberta, finished with a 16th placing. The young cyclist qualified with the 14th fastest time. Sullivan will take part in the Keirin tomorrow, on the last day of competition. In the Women’s Individual Pursuit, Jasmin Glaesser of Coquitlam, BC posted an impressive qualifying time of 3:36.593, the fifth fastest of the group. Glaesser missed qualifying for the medal round by just one spot, a great result for the national team rookie.